Purchase a romantic getaway in New England as a special gift! To order, call us at 800-233-8309 or 603-383-9339 or order online anytime. Available in any denomination or for a specific package or type of room. Perfect for any special occasion ~ holidays, birthdays, anniversaries, weddings or as a thank you gift. 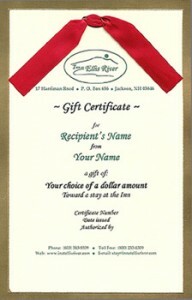 A numbered certificate will be sent directly to the recipient or to you to present. Need a last minute gift? We can e-mail a certificate as a pdf file. If you wish, we will personalize your gift with the addition of items from our gift shop, such as Bride and Groom Rubber Duckies, a pair of our hand-thrown coffee mugs, etc.